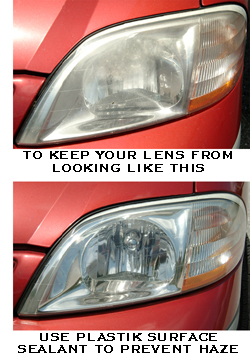 Cloudy, scratched headlight lens covers are a safety hazard as well as a blemish on your vehicle. This condition occurs because the plastic is overexposed to UV light. 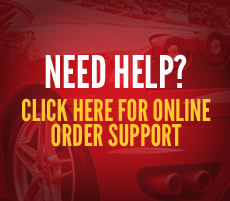 The cloudiness starts at the exterior surface of the headlight lens cover and spreads inward. If caught quickly, this damage can be removed by simply polishing the plastic until it is clear again with Wolfgang's plastic polishes. Wolfgang has developed a two-part system that cleans and clarifies plastic lens covers. This process consists of Plastik Lens Cleaner and Plastik Lens Glaze. By removing the cloudiness from the headlight lens cover, more light is able to pass through the headlight to better illuminate the road ahead. You can see the road and other drivers can see you. Along with this two-part system Wolfgang offers Plastik Surface Sealant, a polymer sealant for headlights. This would be your final step, putting a barrier over your plastic lenses after cleaning and glazing or on new undamage material as a preventative step. The Wolfgang Lens Cleaning System contains the products and tools necessary to clean and restore plastic headlights with a machine buffer.